New MCDE alert! Awesome gospel-inspired four tracker. He returns with a track that's been on hold since he did the remix for Midland's ‘What We Know’ in early 2012. It's another reboot of sorts: choosing his own MCDE imprint as the stage for the new record, Danilo directly confronts the legacy of his insanely loved ‘Raw Cuts’ series that brought the bounce back to deep house, injecting a blueprint grown stale with much-needed emotions and rejuvenating DJ crates worldwide. 'Send A Prayer Pt.1' is exactly the kind of raw sample-based house track that made the 'Raw Cuts' series so good - like KDJ and Theo at their very best, this is the kind of deep house that has the boys AND the girls rocking on the dancefloor with smiles on their faces. 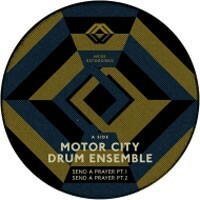 'Send A Prayer Pt.2' ditches the raw sound in favour of a warmer, bass-heavy, Rhodes-heavy rumble - funky! 'The Stranger' goes deep into jackin' territory with a rattling bleep-house number for sweaty basements. The sublime, soulful and hefty 'SP11' closes the EP. Four tracks that make you wish you could instantly be teleported to a packed 2am dancefloor right now.